Where did the Months go? Cara, Roman, Azrael, and Tom are in for big trouble, steamy nights, and howling good fun. Let’s not forget about Cara’s cousins the hot red-haired Evika and sweet Sonya with her two lovable hellhounds. And what up with those orbs? They keep popping in and out of Cara’s life, sometimes helping her, but other times messing everything up by intruding at the worst possible moments. 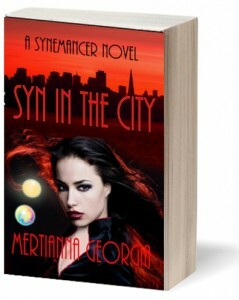 ANGEL OF SYN goes international and inter-dimensional as Cara becomes a fugitive, chased by the Portalkind police. She and her group stumble into a strange Garden of Eden in another Dimension. And, because she’s quickly learning a Synemancer’s life is never simple, this time around she fends off an amorous nephilim (half-angel half-witch), and a dangerously deranged French werewolf. Each hottie has his own reasons for wanting to possess her, body and soul. When is Angel of Syn going to be released?! I am so anxious to buy it/read it! At the least please publish another excerpt!